Speaking of travel, it’s nearly time for Iceland Airwaves again. Though I won’t be going this year, Mike Hedge recently asked me for some tips to get the most out of Iceland and Airwaves so he can make the most of it. recorded a daily hangovercast. In case you missed that last year, or even if you want to listen to it again, you might be pleased to hear that it now has it’s own podcast feed. Subscribe here, or click here to lazily add it to your list in iTunes. Here’s what I‘d want to know if I was attending Iceland Airwaves, and/or visiting Iceland for the first time. I’ve tweaked the message I sent Mike and dotted a few of my photos around to make it more convincing. These are my tips, but I’d also dearly love to hear what I’ve missed for when I go back one day. 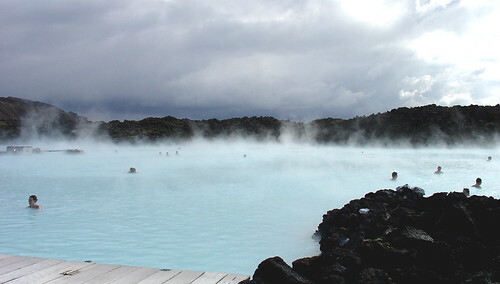 The Blue Lagoon geothermal spa is really close to the big airport at Keflavik. You can, and should, arrange (either in advance, or at the airport when you arrive) a transfer from the airport to Reykjavik via the Blue Lagoon. It’s well worth it, and is a very nice way to unwind once you land. 101 Reykjavik (the postcode for the middle of Reykjavik, which also lends its name to a charming film) is possibly the most intimate and friendly city centre I’ve ever visited. Even during busy times such as Airwaves, everyone seems to know each other. Noticing that you’re from out of town people will want to help make you feel at home. It’s lovely, once you get used to (or are prepared for) the fact that being able to talk to random strangers on the street is a reasonable thing to do. What, in London or New York it would mark you out as an insane person, is perfectly normal in Reykjavik. Amazing scenery generally. We just kept stopping the car to take photos. the Baejarins Bestu hotdog place is famously good. You need one of these. Unless you’re a vegetarian of course. The Hallgrímskirkja cathedral has to be seen. I really liked hanging out at the cafe called Prikið (all these ‘ð‘ characters are pronounced ‘th’ by the way), and as a way of getting into the day with a burger (and all too often a beer) for breakfast-at-lunchtime. The lobster soup cafe/shack is called Saegreifinn on the harbour. You Must Absolutely Go There and have lobster soup with bread. Whale & putrefied shark are optional. Planning is important here. They publish the list of artists, so take a look through and find the ones you don’t want to miss. It will help you plan ahead when the schedule is released. You’ll probably find that the venues are more of less themed. Heavier stuff will tend to be scheduled in a particular venue, mellow stuff in another. Last year, the venue called Iðnó was where a lot of the laid back, and sometimes not so laid back, indie stuff was happening. Many local bands played there, with one whole evening dedicated to music published by the Bedroom Community label. A lot of bands on 12 Tonar were there too. Speaking of which, 12 Tonar is also a great record shop, and will no doubt be one of the better off-venue locations again this year. These off-venue gigs are cool, and a good way to warm up in the late afternoon before the main events start. Some venues will get very busy when the big names are on. bear in mind that about half of the people at Airwaves are locals, who love the fact that big foreign names come over to play. One evening we opted to avoid the crush at the Bloc Party gig, and I’m glad we did. I can see Bloc Party anywhere. I went to Airwaves to listen to icelandic and nordic music rather than stuff imported from the UK, Canada, the US, etc. I found it helpful to relax and enjoy where I was, even if it meant sitting through something I didn’t 100% enjoy (say, because I knew the next thing was going to be awesome) rather than rushing from place to place and always missing the start of every set. Hanging out at one venue for a whole night (which we did at least once, and even when we did move around, we stayed in venues for chunks rather than for just one set) meant less rushing around, seeing things I wouldn’t have planned to see and discovering new acts. Photographers love Airwaves. Partly because Iceland itself is so amazing, and partly because in most of the venues at Airwaves it’s really easy to get right up next to the action. Airwaves is the chance many of these bands have to be showcased to international audiences, and they love the cameras in the venues. (Don’t know about the US, but this is very different to the UK where cameras and recording devices are often banned from gigs). Although there were a couple of venues with dedicated photographer pits right up close, which you needed a press pass to get into, most of the venues didn’t have that though and you can wander up to the front and get some great views (as long as you’re not getting in anyone’s way). Wonderful. Lastly, and this might sound weird, booze in Iceland is taxed beyond belief, and spirits are stupidly expensive, if you can even find a shop licensed to sell anything more than beer. We found that taking a couple of bottles of spirits with us saved us a small fortune. Watch the import limits though. When we flew from London you were only allowed to take 1 liter of spirits per person into Iceland. Have fun in Iceland, and have fun at Airwaves. I’m sure you’ll really enjoy it. Theory: “golden hour” lasts all day here. At this time of year, even in the afternoon the sun is low in the sky, giving you that lovely near-dusk look. Back to the hotel room and paid 500ISK (a little under £5) for 1 hour of wifi to upload photos and check email. Strange, when it’s free in every bar. The Airwaves music festival starts tomorrow. Very exciting. My brother Sam and I are in Iceland for a week. We flew in this afternoon from London Heathrow to Iceland Keflavik, which 40 minutes outside Rekjavik. Importantly, it’s also only 15 minutes from the Blue Lagoon – an amazing geothermally outdoor pool full of blue-green algae and strange squishy mud. The departure of the transfer bus was kept waiting by group of kids delayed in the airport, but we soon forgave them when they turned out to be a choir. A choir which sang beautifully on the bus (and even, briefly, in the lagoon). I don’t think I’ve yet found a better way to relax and de-stress after a flight then soaking for a couple of hours in hot, eggy, milky blue water. There’s a waterfall, grotto-like steam room, and a sauna (which we ignored). Dotted around the edge of the lagoon itself are containers from which you can scoop mayonnaise-like mud. Rubbing white mud onto your face is nice, but the biting wind means you really want to keep your face dry. Post lagoon, San introduced me to the best hot dog in the world ever, complete with the local treat of crunchy onion bits. Here’s a tip: go to the blue lagoon and on the way out, have a hot dog. The hotel is basic, and a 20 minute walk into town, but comfortable. Comparing tour prices with car rental was amusing: 7000 ISK (£70?) per person for one 8 hour trip around three or four of the major tourist attraction (Gullfoss, Geysir, etc). Renting a car, however, is only 4995 ISK for 24 hours. That’s tomorrow sorted then. Walk into 101. The wind is cold, and initially my nose and ears are stinging, so I remember the technique of wrapping a scarf around your head. With that, a hat and a hood, I’m pretty cosy, with the exception of my thighs. And so, we walk into the hippest town centre between London and New York – Reykjavik 101. Hot chocolate at a cafe, then find the 10pm showing of Sigur Ros ‘Heima’ film at a nearby cinema. Wow. Back at around 1am, tired and happy. More photos are being added to this set as I can upload them. I’m getting rather excited about Iceland Airwaves (find it on Upcoming.org and Last.fm). I fly to Reykjavik with my brother, Sam, on Monday 15th October, and we won’t return until the following Monday. Seven whole nights of Icelandic bliss. The festival itself runs between Wednesday 17th and Sunday 21st October, and takes over nine different venues in Reykjavik, as well as a ‘hangover party’ in the Blue Lagooon (above) plus more events running in eleven ‘off-venue’ locations including clubs, record stores and coffee shops. Although Sigur Rós (my long-time favourite Icelandic band) are not scheduled to play this year, Sam and I are hoping to take in quite a bit of the local Sigur magic. Having missed tickets for it in London, I’m looking forward to seeing the film ‘Heima‘ which is playing in Reykjavik that week. Plus, Riceboy Sleeps (formed of Jónsi Birgisson from Sigur Rós and Alex Somers from Parachutes) are exhibiting a new video at the Turpentine Gallery in Reykjavík as part of the Sequences Art Festival. I just need to pack some warm clothes, a notebook, prepare the iPod and get some spare batteries for the camera. 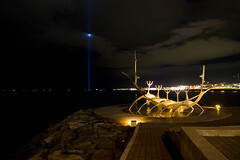 John Lennon´s Memorial Peace Beacon is in Reykjavik. 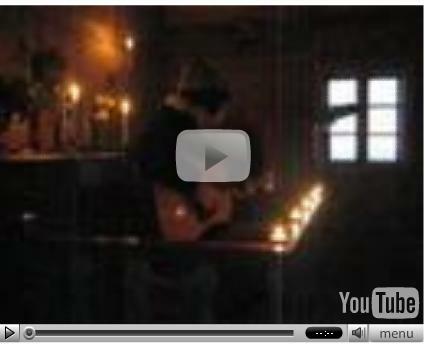 It´s turned on on his birthday (October 9th) and off again on the day he was killed (December 8th).